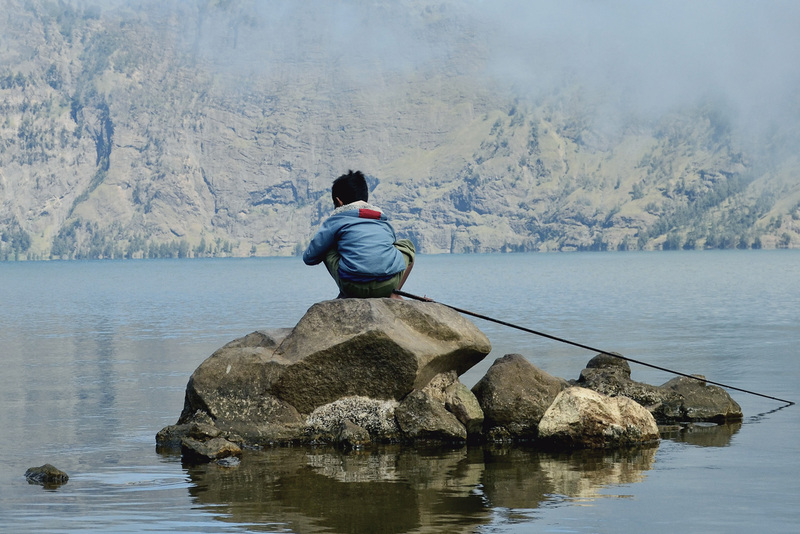 A hiking trip on the mighty Gunung Rinjani. The night before the trip, my girlfriend and I stayed in Senauru. We got picked up from our accommodation at 9am. The pick up was included as part of the organized tour. A luggage room was provided as well, which appeared to be the living-room of the family who owned the homestay where we stayed the night before. The scene at the meeting point was chaotic, many hikers who booked tours from different organizations gathered around. Before we started everybody had to register and sign some documents. Afterwards we were provided with 1,5l bottles of water. Besides the water ration for two persons I took only the most necessary things in my backpack: long underwear for the night, two t-shirts, some crackers, a toothbrush and some toothpaste. Many hikers already started to ascend. Meanwhile we had no idea who was part of our group or more importantly who the guide was. We had no choice left, so we lined ourselves up at the end of the caravan and started the hike. The trail started through thick rainforest, which brought us a comfortable cool climate. I decided to wear adaptable clothes, it turned out to be a clever idea. The dusty way became increasingly steep but consisted of many tree roots, which almost formed a stairway. I managed it quite well with my runners, but i was still jealous over the ones wearing real hiking boots. 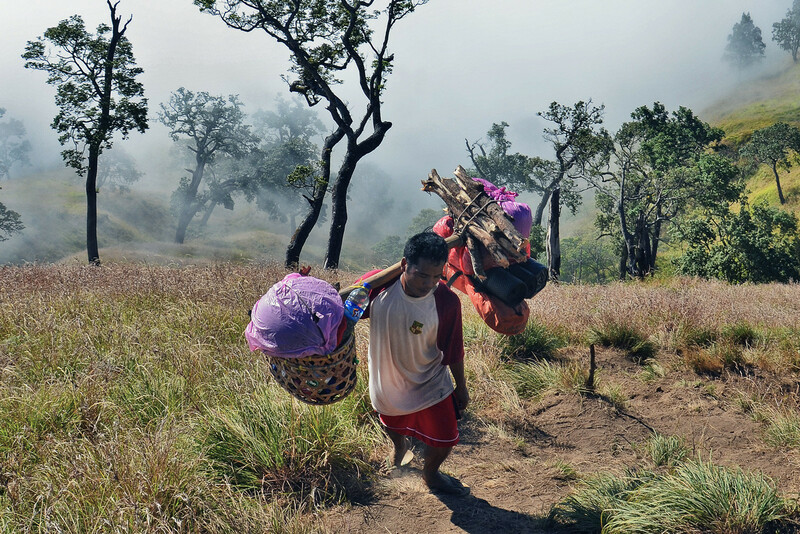 Still I can’t complain, because most of the indonesian porters did the whole trip with flip-flops – tough guys! 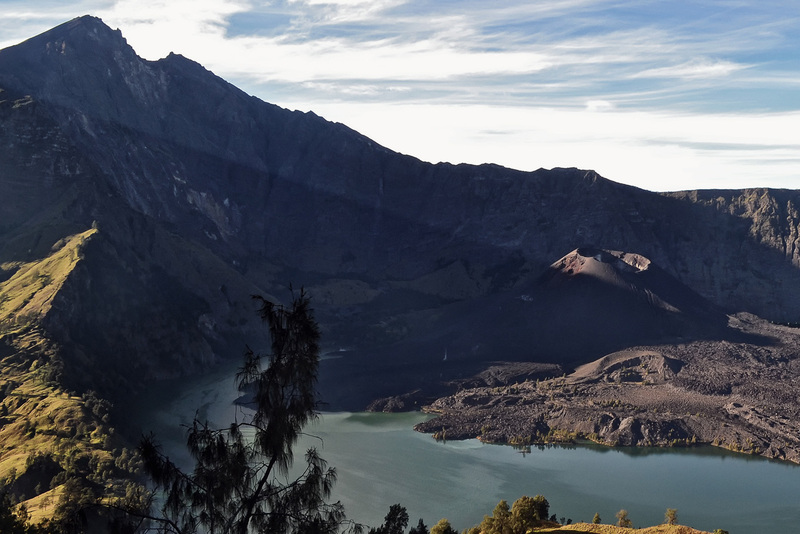 Approximately 1.5h later we reached the Rinjani-Nationalpark. We took a short rest there. It was the last chance to buy some overpriced cold drinks, then we continued the journey. After two more hours we arrived at the first rest station. 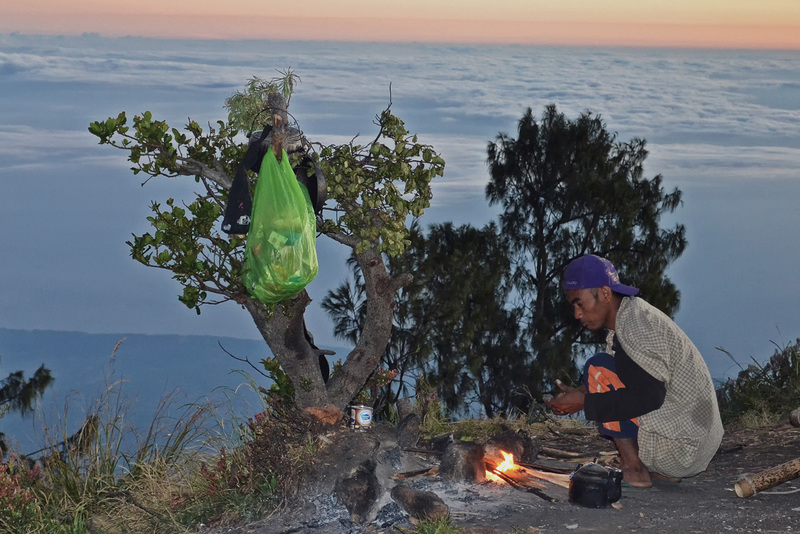 Some porters started to build a fire for hot tea and coffee. I wondered about the hot beverages, but after a few minutes of sitting it quickly became very chilly. For lunch, they served us noodle-soup with boiled eggs and vegetables, “Yummy”. While everybody was sitting around together I took the chance to find out who our tourguide was. Our group members were still vague, what I found out was that they were separating the 1-night and the 2-night tour groups. Some small groups within the groups formed, probably as a result of sharing the same language. There were many people from France, Belgium and the Netherlands, a few from Russia, Indonesia and Italy. We were the only Germans. After a one hour lunch-break we continued the hike. In the meantime, the porters packed up the temporary camp and then shortly after they caught up to us with ease in their Flip-Flops. The next stage of the trek was much longer and went through much denser forest. There we could hear a constant sound of monkeys, which sounded like they were fighting each other. They weren’t very interested in us, as I could barely manage to catch a photo of them. However, they seemed to be escorting us for about half an hour on our way up. Probably to protect their territory. Later on, we went through dense clouds and our sight was very limited. Nevertheless it was not as cold as I had expected it would be without the sun. As we presided to reach higher altitudes the forest was gradually becoming thinner and the path became more dusty. In addition to the forrest, the air was also getting thinner which resulted in necessary breaks, due to increasing shortness of breath. As we broke through the clouds, we ran out of water. But momentarily forgot our thirst because of the amazing view. As one of the porters passed me I asked him for another water ration, but he refused, because I wasn’t a member of his group. He told us that there are porters of our group coming soon – and he was right. We had the last long break before we started climbing the last 400 meters of altitude. After 6 hours of hiking we were at the very end of our stamina and there were still 2 more hours to go to the craters edge at 2600 meters. We could already see the camp which was built directly on the edge. We struggled through the last few meters and were rewarded by a fantastic view at the crater and its lake. It was well worth the effort, just for this view. Amazing! It was well worth the effort, Just for this view. amazing! We took some photos and quickly picked a tent for the night – first-come, first-served. The porters already started building a fire. For dinner we had Nasi Goreng with Krupuk and a piece of fried chicken. The food was ok, with a latent taste of smoke from the fire. Groups, who arrived before us were digging wholes in the ground to use it as a natural toilet. I was very tired and already half asleep when our guide proclaimed the schedule for the next day. I dressed warmly for the night and used my fleece sweater as a pillow, as it was much warmer than I had expected. In the middle of the night I woke up and felt really sick. I had a strong headache and could not sleep anymore then just a few hours – mountain sickness. I would have done a lot for some painkillers, but we had left them in the base camp together with our luggage. When I woke up in the morning the porters had already prepared breakfast. After some pancakes with pineapple and some black tea with too much sugar we packed our stuff and continued the trip, with just 1.5 liters of water left for two people. The descent was more climbing than hiking. Partially we needed to climb backwards, sometimes supported by a handrail. Altogether the way was not that hard, but our legs did still hurt from the first day. On the short way down (1.5 hours) to the crater, we passed many nice photo opportunities. When we arrived at the crater lake there were some other groups who had already set up their camps. We continued walking along the shore to the hot springs. At the hot springs we changed out of our clothes and into our swimwear – no shoes! Such a nice feeling. Our group settled in to one of the first basins, which turned out to be the hottest one. After I warmed up and relaxed for a bit, I explored the further course of the river, which carved its way through the stones to build several waterfalls and natural swimming pools. The water became more clear with every meter. The first one had a brown color from a high iron content and also changed the color of all white clothes into orange. The last one before a deep abyss was the most pretty one, it was even big enough to swim. Aside from a few small fishes I was totally alone – an oasis of peace and calm. After about an hour of rest we spend another hour at the lake. But nobody felt like going into the cold lake after being in the hot springs. After lunch and tea we continued our journey. The water reserves were filled up with spring water, which caused serious stomach trouble for some people. Fortunately my stomach managed the water okay. During the ascent we encountered some really dense fog, which split up the group. The trail became very treacherous at some parts: untrustworthy rope bridges made from bamboo strained over deep canyons, a tiny path at the edge of the abyss – nothing for faint of heart. The pain in my legs returned by the midday break and I thought that I wouldn’t be able to make it to the top. It was hard to find the path in the fog and there was nobody in sight to help guide the right way. At a crossroad we eventually met some other lost people and decided to wait for someone to find us. Some porters arrived about 15 minutes later and showed us the way. With our last little bit of strength we continued climbing the second craters edge and then finally reached the camp. We were pleased to discover a small bar here. Indeed the coke and the beer for 3 Dollar was expensive but absolutely worth it. For a long time we lay in the afternoon sun to relax. Around two hours later two missing Italian girls from our group reached the camp as well. One of them had a blister from the first day and did the whole trip wearing flip flops – poor girl. After we set up our tents and got prepared for the night, the group met up at the campfire and went over the options for the next day. Option one: Start at 3am and climb up to the top to watch the sunrise at 6am and then walk down the volcano. Option two: Start at 8am straight with the descent. Because of my very sore legs I went with the second option. I was briefly awoken in the middle of the night to the sounds of the group getting prepared to finish the climb to the mountain summit. The alarm woke us up at 6am. Even though we decided not to hike to the top, we still wanted to see the sunrise, which was still very impressive from the altitude of 2700 meters. We hit the road after some pancakes. It took me a while to get my legs warmed up but even after that, it was still very painful to walk. We wanted to move on to the Gili Islands the same day, so we started a little earlier than the rest of the group in order to get back in time to catch the last ferry at the harbor of Bangsal at 5pm. All the way down we met other groups, that had just started their tour from Sembalun Lawang. They were eager and exited, we were just tired. After three days of smokey tasting food we could barely have lunch, we were craving for something real to eat. Around 2pm we reached the station in Sembalun Lawang, where we indulged ourselves with an ice cold coke. Half an hour later our guide caught up to us and organised a pickup, which would bring us back to Senaru, where we started the trip and still had our luggage stored. Upon arrival in Senaru we picked up our backpacks and together with a french couple were brought to Bangsal, where we arrived just in time to catch the last ferry to Gili Trawangan. Another 45 minutes later we finally reached the tiny island and were rewarded with beautiful coral gardens, white sandy beaches and crystal clear water.